“Where have you been all my [cycling] life” is not a phrase we would use lightly. But our new Wash Buddy had us saying it the first time we started using it (and the reason why we included it in our Holiday Gift Guide before we even finished the review!) For us a clean bike is a fast bike and nothing is more annoying than washing our steeds to get them race ready and having to decide do we A. 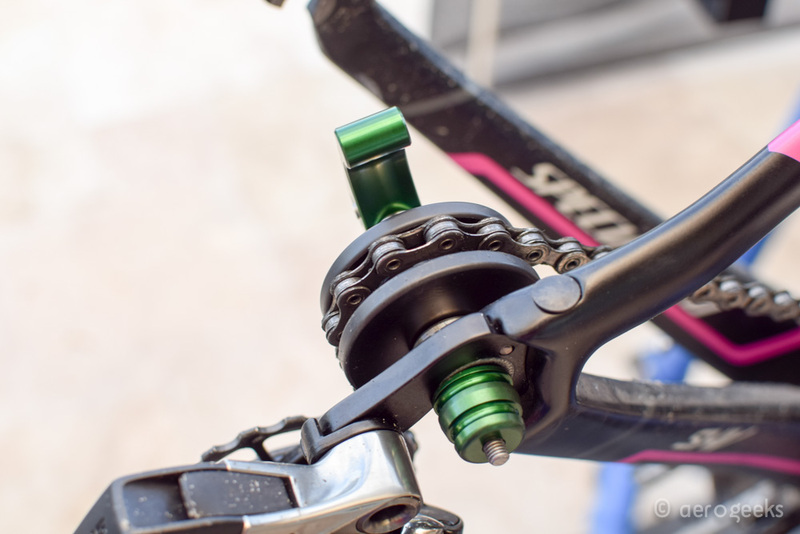 Pull the wheels off and have the grease all over the chainstay and be limited to how we can clean the crank or B. leave the wheel on limiting our access to the frame. 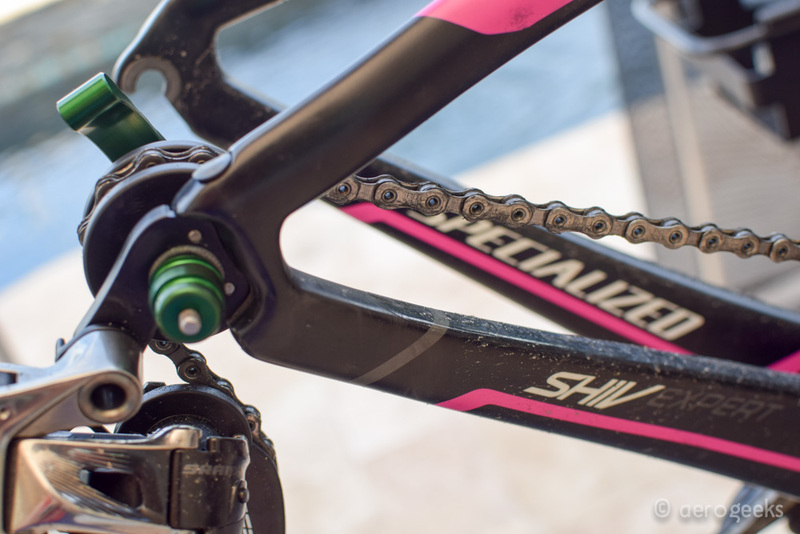 Chain keepers and dummy hubs are the middle ground. Remove the wheel but still keep the chain off the frame – the better options also allow you to easily turn the crank, and the best options are the ones that also allow you to chain to move when you shift – and the Abbey Bike Tools Wash Buddy is one of those best options – no grease on the frame, a free flowing crank, and the ability to shift the rear derailleur. This is our first time reviewing a product from Abbey Bike Tools but their reputation has preceded them. Abbey Bike Tool’s motto says it all – “Our mission is simple, build the best quality bicycle tools on the market.” From day one, Abbey Bike Tools has committed to manufacturing in the United States. All of their tools (including the Wash Buddy we were reviewing) are made and assembled in Bend, OR. Anyone who follows us knows that the AeroGeeks are fans of high quality tools for both our HQ and our personal tool boxes. We want tools that can last a lifetime – the same tool we teach the littlest AeroGeeks to wrench our bikes is the tool that will one day end up in their tool boxes. And while triathletes as a whole aren’t known for spending too much time with their bikes on a workbench – they are known to wash and lube their bikes, break them down for travel, and build them back up at the race site. And this is why we were so excited to check out the Wash Buddy because it makes that washing and lubing so much simpler. 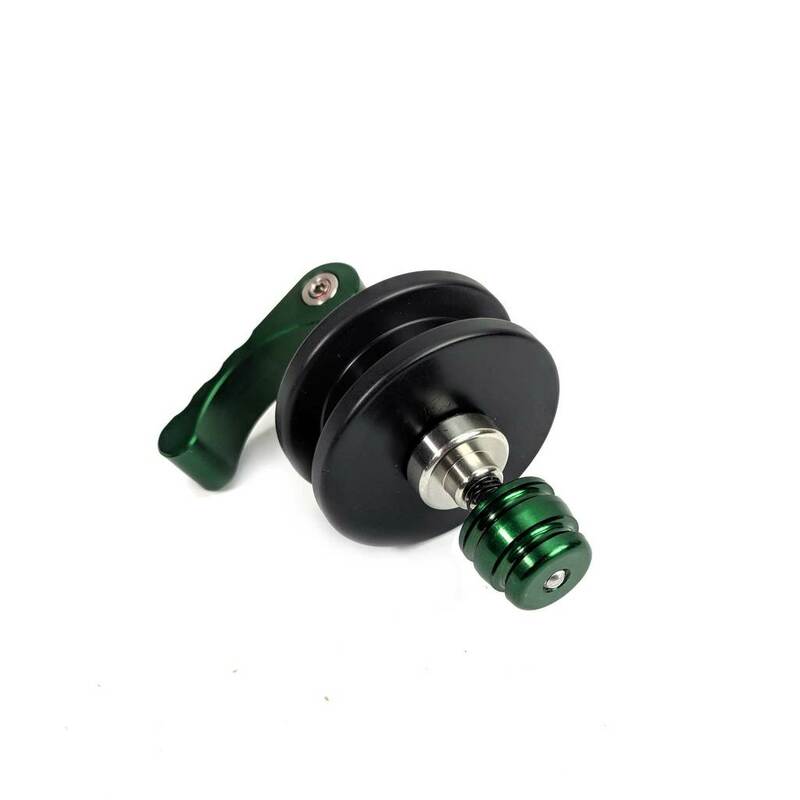 The included Wash Buddy axle is stainless steel (again very corrosion resistant and an upgrade versus other options out there), and as we mentioned above allows the pulley to slide back and forth as you change gears. 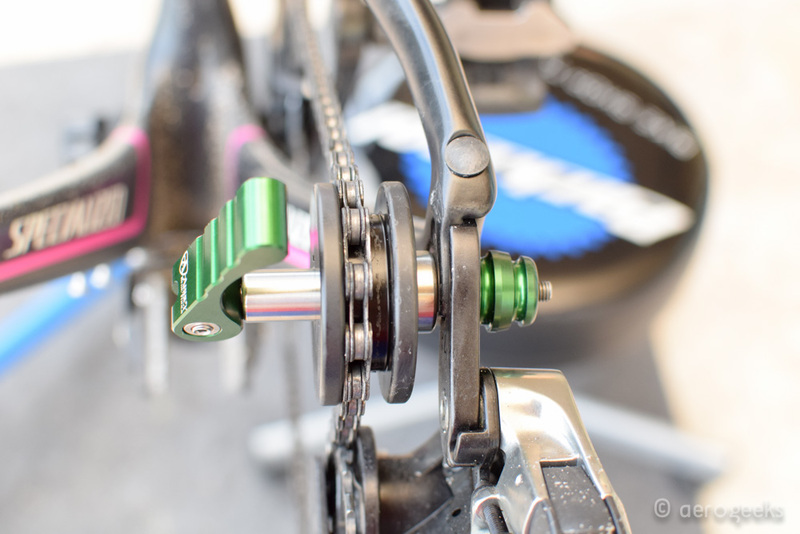 Prior versions of the Wash Buddy featured a Paul Components skewer but Abbey Bike Tools switched to an in-house skewer that dropped the price $20 (to an as tested price of $55) and we found to work just as well as the best race wheel skewers we have used. The first time we used the Wash Buddy we were pretty blown away with all the features. The Wash Buddy is compact, allowing you to install it with a single hand (in our case our non dominant left hand had no issue getting it placed and clamped). Once we had it locked in place we started spun the crank a bit and that’s when we started to be really impressed with what the wash buddy delivered. Though as it happened, it started with a weird clicking noise. Out of habit whenever we pull a wheel off we always have the chain in the smallest rear cog, which is how we had our Shiv set up when we first installed the wash buddy. And when we first spun the crank we noticed a clicking coming from the wash buddy – but then we shifted up and BAM – blown away. The noise went away and as we kept going through the shifts we were impressed with how smoothly the Wash Buddy traveled across the axle. (The clicking noise did show up at the lowest and highest cogs but wasn’t an issue beyond that). 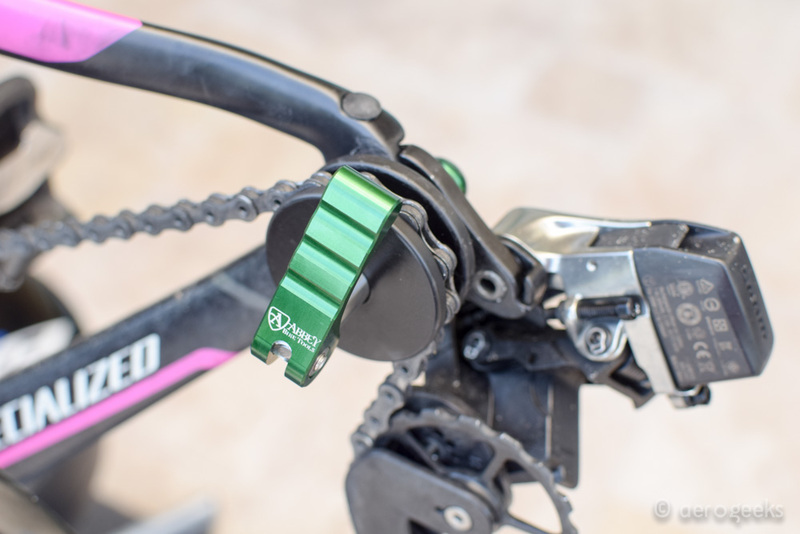 For those wondering why shifting is such a benefit of a chain keeper or dummy hub – it’s all about getting the rear derailleur moving and both inspecting its operation and getting behind it to keep everything squeaky clean. The only negative we have found with the Wash Buddy is the price. At $55 it’s one of the most expensive options out there. But for us that typically wash our bikes every two weeks (and weekly when the rainy season is around), having a product that hits all the checkboxes AND that can stand up to that amount of weekly use is critical (the AG graveyard of chain cleaners and bike towels is a testament to this usage). And more so investing in a product that we believe can stand up to years of abuse and just keep on spinning is a big plus in our books. From it’s first use the Wash buddy has found its home in the AG tool box. It meets all the needs we can think of and is built to last. For anyone that hates the decision on how best to wash their bike – or just wants to store a bike with the wheel off and no grease on the chain stay we suspect the Wash Buddy may be the answer. Be sure to stay tuned to AeroGeeks.com for more reviews this holiday season and don’t forget to check out our Holiday Gift Guide for all your cyclist and triathlete gift buying needs!